I dreamt about visiting the Pink Lakes near Rio Lagartos, Mexico ever since I saw a photo on Instagram. I couldn’t believe that this magical place was in Mexico and that I might be able to see it in the flesh. 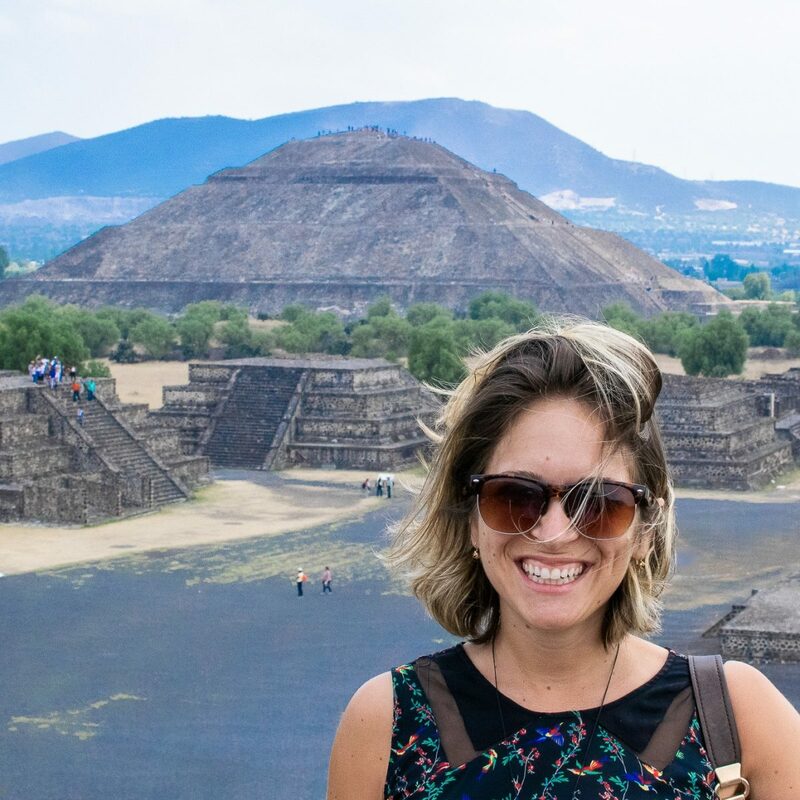 Back in January, we booked a trip back to the Yucatan for a two-week break over Easter when Luke would be off from work. Heading to the Pink Lakes was at the top of my Mexico priority list. I did tons of research about the area (although there isn’t much in English, to be honest) and found out that instead of heading straight to Los Colorados like I’d initially planned, the nearby town of Rio Lagartos had way more to offer in terms of sights to see. 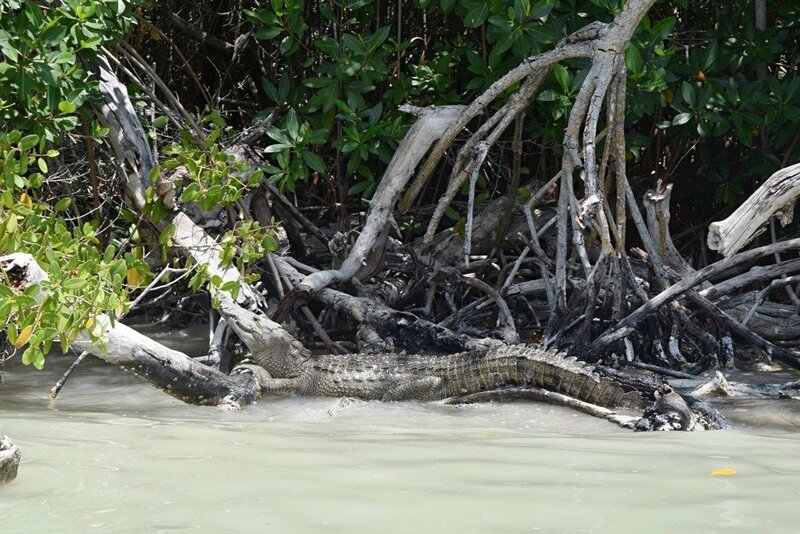 There’s no doubt about it, if you want to visit Rio Lagartos, you’ll need to rent a car. I think that there is one ADO bus per day between the small town and Cancun, but I didn’t see a bus station and I couldn’t find any proof of this on the ADO website. and got a really great deal. We paid $17 a day to have the car for seven days. It’s the first time I’ve rented a car in Mexico and it was really easy to do, so I think it’s definitely something Luke and I will be trying out on our next tour around Mexico. It’s a really simple journey from Cancun to Rio Lagartos and it takes about two-hours. There’s a toll you have to pay on this road, which was about 120 pesos ($6). You must pay in pesos. You can also easily get there from Merida. The drive was also about 2 hours and we didn’t avoided the toll road this way. If you take the toll road I believe it’s about 150 pesos ($7) and it’s only slightly shorter. Once you get to Rio Lagartos there’s plenty of free parking along the waterfront. We left basically all of our valuables in the car and there was no issue at all. The main thing to do, and perhaps the only thing to do, in Rio Lagartos, is to take a boat ride. There are tons of different people touting for your business. A few speak English and tons more don’t. We headed straight to the “official” tourist center where we got a boat and a guide who spoke a tiny bit of English. As soon as we paid, we hopped on a six-person boat and headed out into the water. Rio Lagartos means Alligator River and was given that name incorrectly by the Spanish when they were here. It’s not actually a river, it’s an estuary, and there aren’t any alligators, but crocodiles instead. 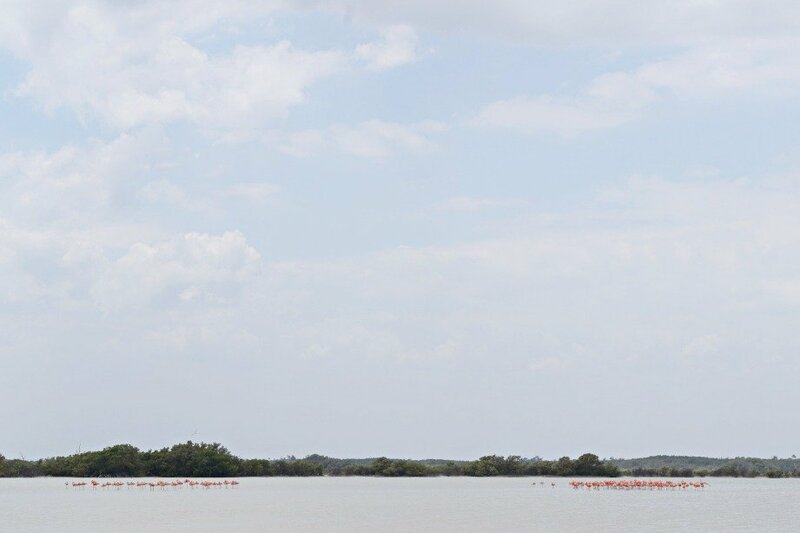 One of the biggest draws of this area, besides the colored lakes, are the flamingos. 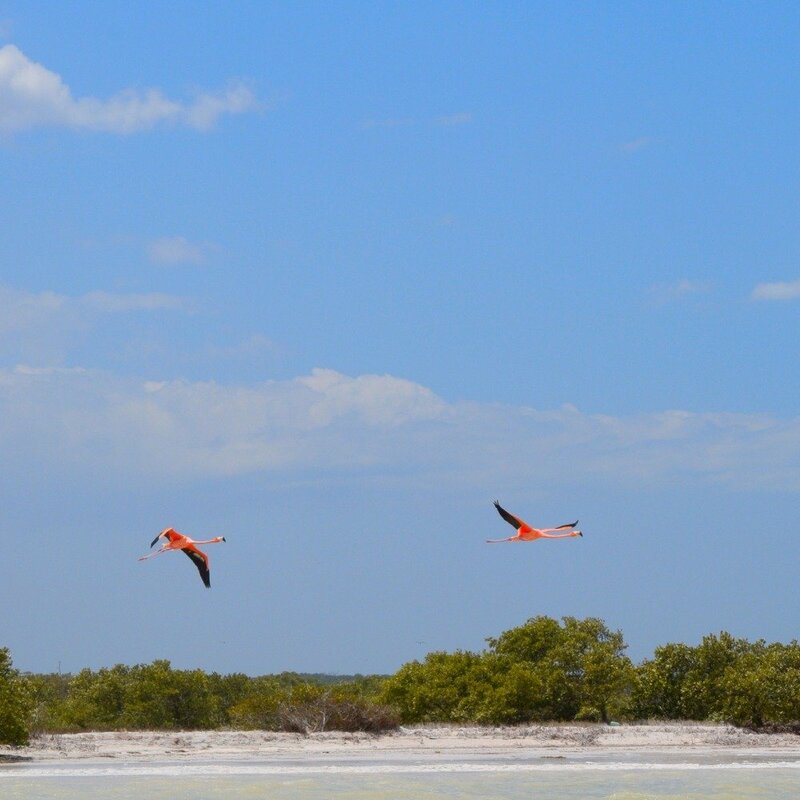 Rio Lagartos has the largest concentration of flamingos anywhere in Mexico. We saw pink everywhere! I’ve never actually seen a flamingo in the wild so it was really cool to see how they huddle together and when one flies away, they all join in. We saw loads of crocodiles, beautiful wild egrets and herons. We got out of the boat at one point and rubbed this amazingly soft clay all over ourselves. I’m still trying to clean it off my flip flops! When we washed it off our skin was so smooth. The lakes weren’t pink but the contrast of the orange with the bright blue sky was so beautiful. But What About the Pink Lakes? I suppose the one thing that was slightly disappointing? The lakes weren’t pink. 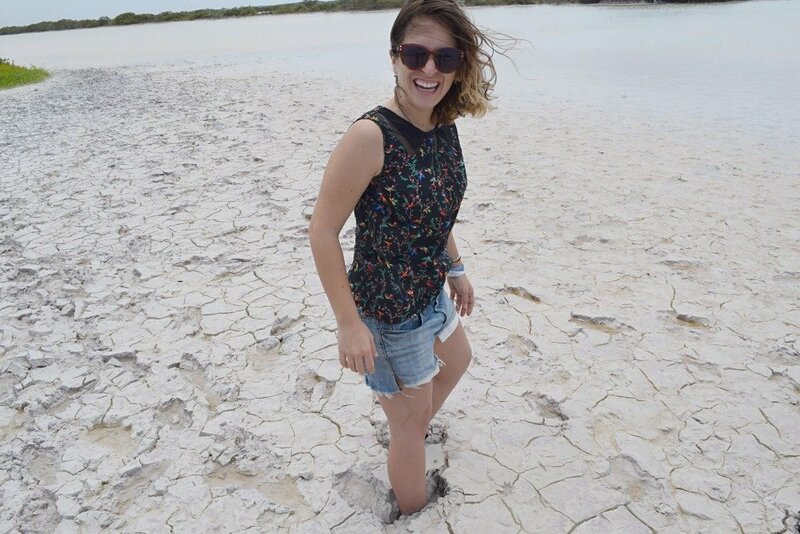 You see, the salt lakes are constantly changing colors depending on their salt levels. 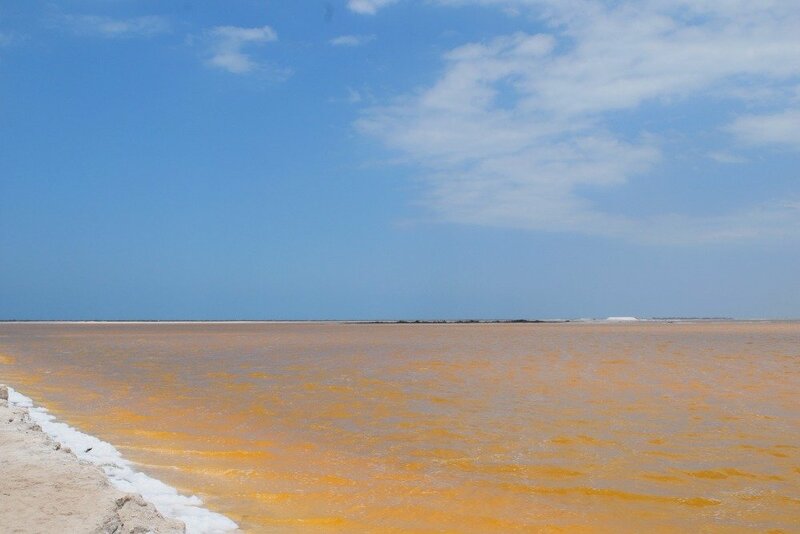 When we went, the water was this crazy orange color. It looked like it was full of mud. We did actually see some pink lakes on our drive from Merida, but there was nowhere to pull over and snap photos. I know that during different times of year the lakes in Rio Lagartos are actually pink, but they weren’t when we went. After all that we’d seen that day though, it seemed like such a small, insignificant detail. Huge flocks of flamingos just hangin’ out. 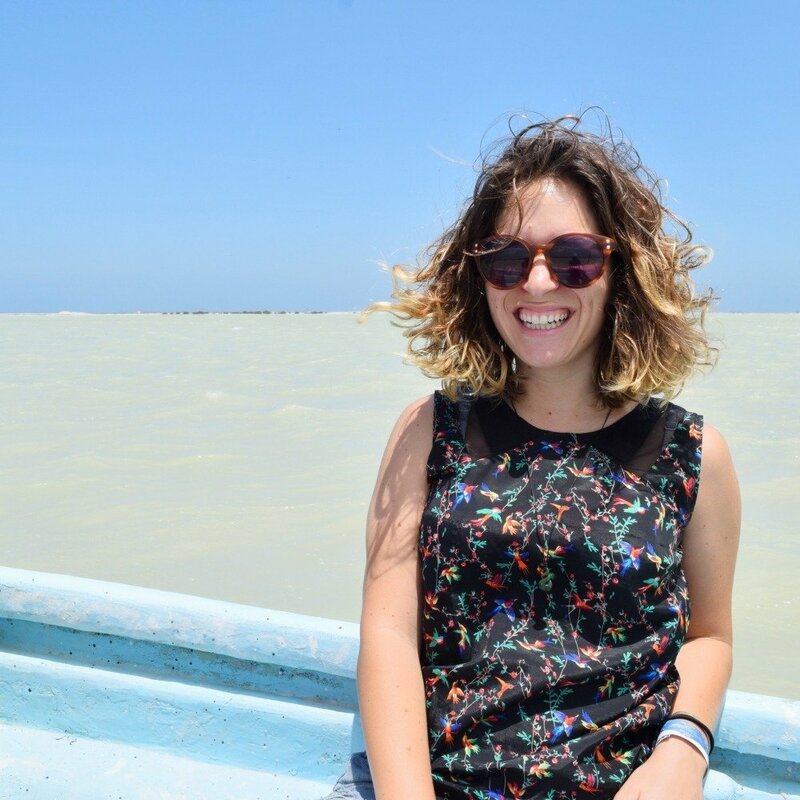 If you go to the main tourist information center you will pay 1,000 pesos ($50) for a two-hour boat ride. This is for the whole boat whether there are two people or six people. There were four of us, so we paid 250 pesos ($12.50) each. In addition to the fee for the boat ride, you also have to pay a small national park fee. Beside the tourist office is the office for the national park. The national park fee is currently 32 pesos ($1.50) and they’ll give you a wristband to wear once you’ve paid. I did eavesdrop on a few other conversations people were having with other boat companies along the pier. If you want to go to one of the places where you have an English speaking guide, you should definitely attempt to negotiate. One guy quoted two girls 1,500 pesos for a boat trip ($75) and another quoted a family of four 2,000 pesos ($100). If you come on your own or with just one other person, it’s common during high season to look for other travelers in some of the restaurants. This makes the cost much lower since obviously you pay for the whole boat, not per person. Stuck in the mud! This stuff was like walking on liquid marshmallows, aka HEAVENLY. The town itself isn’t very big. Everything there is to see and do is centered around the pier, including three or four little seafood restaurants. We looked at the menus of a few different places, including Restaurante La Torreja and Ria Maya Restaurante. We opted for Ria Maya because we could sit on the second floor and look out over the estuary. It was also slightly cheaper and a little cheerier than the others. The specialty of the area is fresh fish, of course. You can have it fried or grilled. I had it grilled with garlic and it was incredible. It only cost about 100 pesos ($5) which included rice and tortillas. Can you spot the croc basking in the sun? I kid you not when I say this is one of the most beautiful places I have been to in all of Mexico. The water is this insane shade of blue, there is an abundance of wildlife to see, the estuary is clearly well looked after by the national park trust, and the overall experience was one that I really enjoyed. For less than $15 each, we spent two hours out on the water seeing some incredible wildlife up close. We went during the Easter holidays and it wasn’t really that busy. It’s not packed with tons of boats disturbing the birds. I think because it is slightly out of the way of the main tourist attractions, many international visitors skip out on this amazing spot. Have you ever been to the pink lakes? I’d love to know what your experiences were! That’s too bad that you missed the pink! We were there in January and there were both pink and orange lakes. Unsurprisingly, we took more photos at the pink ones. It looks like you guys had a great time anyway–we didn’t make it to Rio Lagartos on our trip. That must’ve been cool! It was still definitely an amazing place and if you get back to that region I highly recommend a visit!